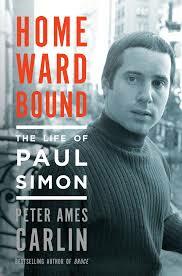 If ever a career in music was pre-ordained it is that of Paul Simon, the ambitious, gifted and ever-so-scrupulous first son of a professional double-bass player and the champion of this book, a biography as diligently researched and carefully considered as any of the songs in Simon’s extensive repertoire. Though clearly an admirer of his music, Peter Ames Carlin nevertheless feels duty bound to cast a less than approving eye on a man whose self-belief – some might call it arrogance – results in him repeatedly turning a deaf ear to well-meant advice, often with unfortunate results, as well as a distressing reluctance to share credits with collaborators. He's also on the depressive side, unfulfilled despite it all, and consequently resorts to psychoanalysis, usually successfully. The result is that Homeward Bound portrays Paul Simon as largely uncongenial, certainly not someone with whom you’d want to relax over a couple of beers, let alone share a catchy riff you’d discovered on your own guitar. On the plus side, Simon is no fan of the cult of celebrity, generous towards charities and always pays his musicians well, sometimes when they don’t even know it, as was the case with British folkie Martin Carthy who introduced him to, and taught him how to play, ‘Scarborough Fair’, the traditional ballad that opens Parsley Sage Rosemary And Thyme, the third album Simon recorded with singer Art Garfunkel. Simon credited himself as the writer but dutifully sent a proportion of the royalties to Carthy’s music publisher who shamefully failed to pass them on, with the result that in his ignorance Carthy held a grudge against Simon for years until the issue was finally resolved after they shared a stage together in 2000. This is but one of many interesting instances that Carlin brings to light where Simon appears guilty of minor larceny. Plagiarism is too strong a word, but Simon has a tendency to hear something, or be alerted to something, which after a good deal of chopping and changing, remixing and re-arranging and almost always adding his own lyric, he makes his own. Often this is tangential, as in the case of the musician Heidi Berg who in early 1984 drew Simon’s attention to music from South African townships by famously loaning him a cassette tape she had found entitled Gumboots: Accordion Jive Hits No 2. Simon liked what he heard and two and half years later released Graceland, heavily influenced by that cassette and which arguably rescued his career, or at least gave him a new one, but Heidi Berg, without whom, is mentioned only in the very small print and referred to not by name but as ‘a friend’ in Simon’s own sleeve note. She didn't even get the cassette back. At the heart of this book is the volatile relationship between Simon and Garfunkel, a running theme of friendship and hostility that Carlin returns to time and again, often with eye-opening revelations about their endless rivalry and petty squabbles. This began in the Tom & Jerry era, that rather odd pre-S&G phase wherein they launched themselves as a precocious doo-wop duo, all smiles, crew cuts and sweaters, a time of innocence you might think but you’d be wrong. To his credit Carlin has researched this period, about which little has been written before, with extraordinary diligence, so much so that I found it one of the strongest parts of his book (vying with the political fallout from Graceland and the slow-burn build up to the Capeman debacle). Accordingly, we learn that Jerry (Paul) went behind Tom’s back, making recordings of his own under various pseudonyms, and that when Art found out he went ballistic. Even now, over 55 years and heaven knows how many millions of records sold later, this subterfuge still rankles. 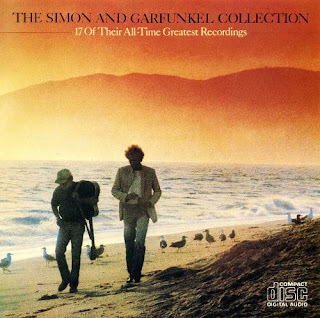 Its nadir was probably reached when they refused to be photographed together for a 1981 hits compilation, thus requiring their record company to hire lookalikes photographed in shaded soft focus as they stroll by gentle waves along a seashore. Simon & Garfunkel, or is it? All of this keeps us on tenterhooks as we progress through the sixties, the S&G years. They keep up the pretence well, the best of friends as their renown escalates, amiable quips shared on stage, but the tense undercurrent is always there, exacerbated by Simon’s need for control, Garfunkel keeping him waiting, their physical differences and the overlying sense that their personalities simply don’t gel. Well, John and Paul Beatle didn’t always see eye to eye either and neither do Mick and Keith Rolling Stone, let alone the Everly, Davies and Gallagher brothers, so perhaps we have disparity to thank for some of the finest pop music of the second half of the 20th Century, and I include in that the three greatest S&G albums, Parsley…, Bookends and Bridge Over Troubled Water. Long before the break-up of S&G it is clear that Simon wants to make it on his own, and it is also clear that he has always had eclectic tastes, that never ending need to broaden his musical palette. He was researching ‘world’ music long before Graceland; witness ‘El Condor Pasa’ on the Bridge album, ‘Mother And Child Reunion’ on his first solo record and the gospel and Dixieland excursions on his second, … Rhymin’ Simon. He is an avid reader of good books, a confidant of A-list actors, TV directors and film makers, and he repeatedly reaches out to teachers who can offer knowledge of technique, musical theory and literary skills. As a result, the career lows – notably the One Trick Pony movie and Capeman musical – tend to be redeemed by the quality of the songs within, both lyric and melody, which Carlin analyses and critiques with a clear eye for style, detail and procedure. It is to Simon’s credit that when things do go awry for him he has an uncanny ability to back off, lick his wounds and bounce back, even if that does mean a call to his old friend and rival who lives in equal splendour to himself on the other side of New York’s Central Park. The book is refreshingly direct, focusing almost exclusively on Simon and only very occasionally veering off into matters concerning his rivals, usually Bob Dylan, or politics, and only then when it is pertinent to career choices that the generally apolitical Simon makes. Too many rock biographies resort to this kind of thing as padding but this one doesn’t, and to this end Simon’s personal life is not ignored. We learn of his marriages, and how the first two – to Peggy Harper (the ex-wife of S&G’s manager) and to actor/writer Carrie Fisher – broke up, and his immediate family, a troubled only son from his first marriage, and three later children, two boys and a girl, with third wife Edie Brickell. We learn too about the earlier generations of the Simon lineage, the tailor from Galicia, another Paul, who emigrated to America in 1903, and Louis the bass player, who found it difficult to come to terms with his son’s fame and enormous fortune. He desperately wanted his elder son to become a teacher and it wasn't until this very famous son reached the age of 50 that Louis could finally find the words to tell the multi-millionaire rock star, his boy who drew 750,000 to a concert in Central Park, how proud he was of his achievements. Finally, I warmed to his book because here and there Carlin drops lyrics from the Simon canon into his text, usually to stress a point yet never tritely or as a cliché. Search and ye shall find. It’s a lovely touch, a sure sign that not only does Peter Ames Carlin know his subject inside out but that he cares about his readership. Those fans that might be deterred by the unflinchingly objective light that Homeward Bound shines on Paul Simon will nonetheless be charmed by the warmth bestowed in this pleasing, slightly whimsical, attention to detail. It was about 10pm. 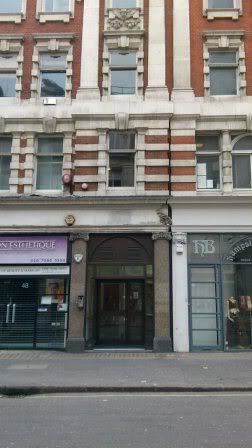 I was walking from Gt Portland Street to Oxford Circus tube and took a detour down Margaret Street. 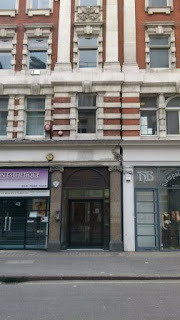 Outside the awning at number 48 was a crowd of people behind one of those ropes designed to separate smokers from passers by, and there was a stern looking black doorman guarding the old door. Emboldened by drink, for I had been at a Christmas party, I went up to one of the smokers. “Is that still a club down there?” I asked. … through the doors and it’s one great big room now, unrecognisable really; no bar, at least not where it used to be on the left as you entered, no dining room where Luigi served the best petit pois and peppered steak in the whole of London, just a big open space though I noticed that at the very far end, where the stage used to be, there was a place where drinks were dispensed. A band with a black girl singer was playing pumped up soul music on a big stage along the wall behind where the bar was. It was very noisy and packed, and the lighting was quite bright, much brighter than it used to be, and I stood there misty-eyed amidst all these people and thought to myself that not one of them would have known the history of where they were partying tonight. I lost my friend in the crowd and was alone, and I stood out because I was more than twice the age of everyone else there. I had a lump in my throat. Must have been the red wine I’d drunk earlier. I stayed for maybe five minutes, feeling a bit foolish in my big warm coat and scarf amid people milling around dressed for a party. A few people stared at me, wondering who this old geyser was, and I’d have chatted with anyone who wished but the music was too loud for conversation. So I left, climbed up those stairs again and into the night. The doorman smiled at me. “Is it like you remember?” he asked. There can’t be many amongst us who haven’t at one time or another wished we could turn the clock back to a period in time when life seemed like a fairground ride. For me, like David Hepworth, doyen of Smash Hits, Q, Mojo and The Word, that period in time might just be 1971, my first full year as a staff writer on Melody Maker, my feet just about under the table, my antenna tuned exclusively into the rock and pop of the day, my work and play focused entirely on and within what the great PR man Derek Taylor called ‘the industry of human happiness’. I saw The Who perform nine times that year, the last time in Charlotte, North Carolina, on my first trip to America. I saw the Stones and Faces twice, Zep once (at the Marquee, of all places), dozens of others, interviewed McCartney, discovered Slade and, most weeks, was responsible for MM’s front page lead story at a time when its circulation rose to 200,000 an issue. I lived in a flat in Bayswater where free albums galore piled up next to my Dynatron stereo on which Gasoline Alley, Imagine and Who’s Next were on permanent rotation. What a lucky sod I was. 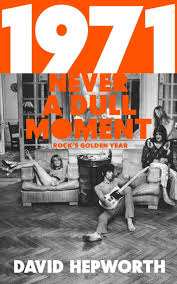 It is Hepworth’s contention that 1971 remains the most important year in the history of rock and his book sets out to prove the point, month by month, album by album, song by song, and he succeeds. Although it focuses on 1971 we read about what went before, insofar as it reached an apogee that year, and some of what went on after, insofar as its genesis can be traced back to that year. It deals with the UK and US rock worlds side by side, skipping across the Atlantic with the regularity of The Who and Led Zeppelin, two of the first three UK bands to realise and take full advantage of the rewards that America offered, both of whom – along with the third, The Rolling Stones – occupy plenty of pages herein. Hepworth sets out his case with the scholarly logic of a barrister addressing a government inquiry, at least as far as his research is concerned, though he’s a great deal more colourful in his delivery. He writes pithily, often amusingly, and the dry humour makes for an easy, fast read as well as an enlightening one. Setting the scene, he notes that, amongst many other things, there were, ‘no joggers, no health shops, no gyms, no leisurewear, no trainers, no mineral water, no Lycra, no fast food, no obesity’ (my italics). Clarifying the socio-political and economic importance of Carole King’s Tapestry album in the January chapter at the beginning of the book he notes that for the cover photo King wore, ‘a sensible pullover and jeans, much as she would have done had she been weeding the garden’, a few pages later Bette Midler is precisely sketched with the succinct tongue-twister, ‘saucy tongue sheathed in rouged cheek’, and towards the end we have Mike Love described oh so accurately as The Beach Boys’ ‘most reliable source of embarrassment’. Equally amusing is the suggestion that, for Sly Stone, ‘the many women in his life were giving him grief about the many women in his life’ and that, because Mick Jagger felt it was bad form to be without a girlfriend, ‘This inevitably resulted in periods of overlap which could be fraught’, litotes at its best. It’s not just the quality of the music that supports Hepworth’s case. It’s the way in which the music is marketed and the way in which those who make the music conduct their affairs and themselves, all of which changed, or deepened, or solidified, in 1971. To this end the long and at times tongue-in-cheek description of Jagger’s marriage to Bianca – ‘the shabbiest bunfight in the history of both rock and marriage’ – which forms the centrepiece of May is not there just for amusement – though amuse it certainly does – but to illustrate how in this period rock stars became the new high society and how the event was as à la mode as debs’ balls or royal weddings. In reality the book boils down to a series of smartly turned out essays on those acts that held sway in 1971, Hepworth having correctly identified that in many cases this was the year in which they wrote, recorded or released the music on which their careers and reputations have relied upon ever since. In the case of the three British acts I mention above he's not wrong, specifically Who's Next, Led Zeppelin IV and Sticky Fingers, more specifically, ‘Baba O'Riley’, ‘Stairway To Heaven’ and ‘Brown Sugar’. Coming up on the inside are David Bowie, Cat Stevens and Rod Stewart while Marc Bolan – ‘not one for digging out a valuable away point’ – will fall by the wayside. Oddly, the only rising Brit superstar missing from Hepworth’s otherwise infallible summation is Elton John, who also had a pretty good year in ‘71. So did George Harrison, whose Concert For Bangla Desh provided the template for all future charity rock concerts and which occupies most of Hepworth’s chapter on August. Hepworth notes that this was the first time that Beatles songs had been performed with distinction by anyone other than The Beatles, a hint of the forthcoming realisation that for many acts for whom 1971 was a vital year, the past was the future, especially for The Beach Boys. He points out that heritage rock had yet to be invented, which reminded me that when I watched The Who in Hyde Park in the summer of 2015 I wasn’t alone in noting that the most recent song in their set was 33 years old. It’s not all about the superstars. Hepworth writes perceptively about many lesser names, among them favourites of mine like Nick Drake, Harry Nilsson and Badfinger; also the labels whose proprietors took chances on acts unlikely to find commercial acceptance, not at first anyway. Occasionally he goes a bit off-piste (as far as 1971 is concerned) by digging back into the past, most noticeably in his history of Motown – he's pro Stevie but a bit anti Marvin – which takes up much of April. Still this is a minor quibble, and I can forgive anyone who writes with calm assurance that, ‘No rock and roll band before or since have been more accomplished live performers than The Who in the years between 1968 and 1972’, a sentiment with which I most heartily concur. Recommended as a Christmas present, especially for those who bought MM when we sold 200,000 copies a week. ELVIS KIDNAPPED – Latest News! My plans to self-publish my novel Elvis Kidnapped as an e-book at the end of November have been postponed because friends whose advice I respect have persuaded me to seek a ‘real’ publisher instead. To this end the manuscript has gone out to five literary agents and a couple of contacts I have at big mainstream publishers. It may be that this will come to nothing, in which case I’ll go back to my original plan, but since Elvis Kidnapped has been taking up space on my hard drive for a long time now, a few more weeks won’t make much difference. So, sorry to disappoint anyone who read the extracts I posted on this blog and was looking forward to it. One way or another it’ll happen in 2017 which, of course, will see the 40th anniversary of Elvis heading up the great Heartbreak Hotel in the sky. The arrival of a new record from Gillian Welch and her partner Dave Rawlings is an eagerly anticipated event at Just Backdated. 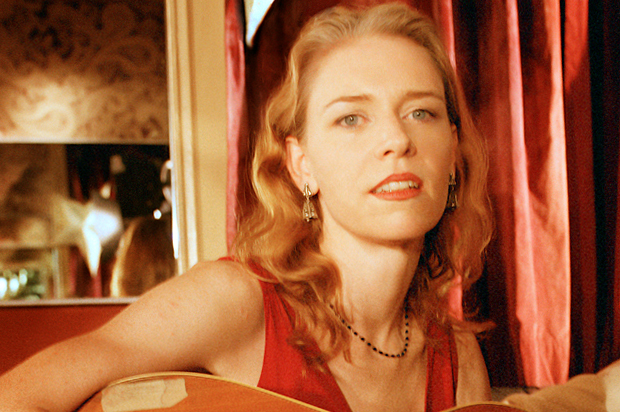 Welch is parsimonious to say the least when it comes to releasing her work, no new recordings having surfaced since The Harrow & The Harvest in 2011, and only three further studio albums and an eight-track live set having been made available in the 20 years that have elapsed since her extraordinary debut Revival. 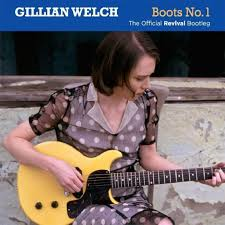 This new release fills a gap but it’s not really new, being instead a 2-CD set of outtakes, alternative versions and demos from Revival, 21 tracks in all, including seven songs that haven't appeared on record before, together with a studio version of ‘Wichita’, hitherto available only as a live track on the Revelator Collection DVD, Welch and Rawling’s only live recording, and an outtake of ‘Red Clay Halo’, the bluegrass romp that wound up on Time (The Revelator) in 2001. Well, as far as Just Backdated is concerned the odds and sods from Welch and Rawlings are considerably more worthwhile than most artists’ greatest hits, and I’ve been listening to this compilation for four days straight. Revival, released without much fanfare in 1996, was and remains a hugely influential record, the precursor to Americana, a kind of historical country genre that like the songs on The Band’s first two albums exists outside of time, old but new, traditional but contemporary, and definitely rural. Revival was a stunning debut from a couple who seemed to have stepped out of the past; 10 peerless songs, every one of them perfectly formed, superbly understated, mostly dark, always poignant. She even looked the part in her calf-length dresses, pale countenance and unshowy flat hairstyle (though of late she's gone blonde with startling results). 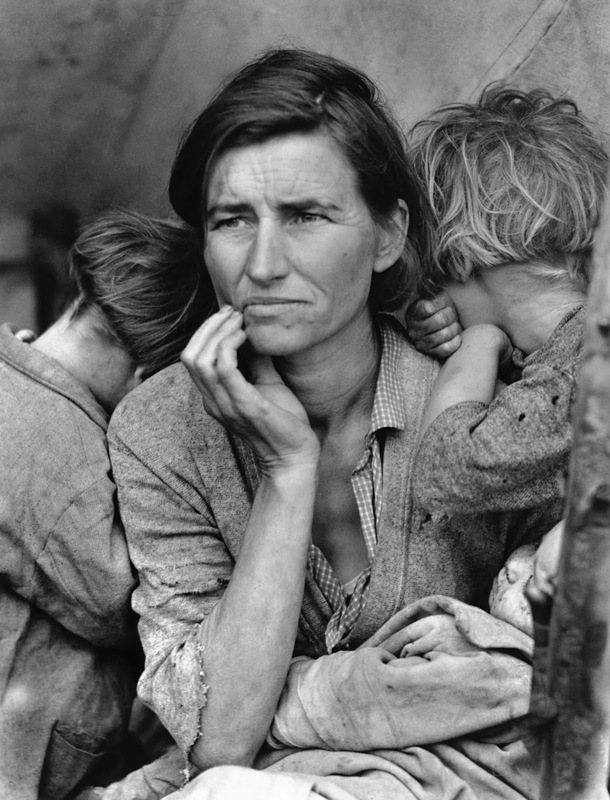 As I wrote in a concert review of the duo some years ago (to all intents and purposes they are a duo, in all but name), their songs are a throwback to the time of America’s Great Depression, and are peopled by the dispossessed, migrants and orphans, poor families with too many kids and simple folk who put their trust in God. In a line or a few words Welch evokes hardship and period in the manner of John Steinbeck and the photographer Dorothea Lange whose Migrant Mother adorns a wall in our house. All we’d heard from Gillian Welch until Revival was the song ‘Orphan Girl’, covered by Emmylou Harris a year before the album was released. Now probably Welch’s best known song (though ‘Elvis Presley Blues’ from Time (The Revelator), lately impressively covered by Tom Jones, runs it a close second), ‘Orphan Girl’ appears twice on Boots No 1, firstly an alternative version without the slightly Twin Peaks-doomy electric guitar that arrives late on the familiar version, and also as a home demo. Welch’s vocal inflections are remarkably similar on all three versions, setting the melancholic tone for almost all that follows. Much the same applies to the majority of the outtakes of tracks that appeared on Revival, with Welch’s parts fairly consistent through the recording process while slight variations in the guitar accompaniment, Rawlings’ contributions on choruses and solos, and minor adjustments to the tempo and backdrop of songs offer an insight into their gestation. Nevertheless, for those of us who consider Revival to be the Sgt Pepper of Americana, it’s fascinating to hear demos and early versions of songs we now know so well, and to read about their development in the excellent sleeve notes. ‘Annabelle’, in which a mother mourns the loss of her infant daughter in a ‘hard life of tears’, appears to have been initially titled ‘Words On A Stone’; ‘Pass You By’, of one Revival’s more strident tracks – and I use the term cautiously – began at an easier pace with Jim Keltner’s shuffling drums more relaxed and producer T Bone Walker contributing a bluesy solo; a stereo mix of ‘By The Mark’ brings out the delicate counterpoint harmony between Welch and Rawlings on the chorus; two versions of the sultry ‘Paper Wings’ show off Roy Husky on stand up bass and Rawlings on pedal steel; and an early (1993) demo of ‘Tear My Stillhouse Down’ lacks the full on backdrop of the Revival take but shines through in its relative simplicity. Of more interest, though, are those songs previously unavailable, some of which the duo evidently performed on stage early in their career. On Disc 1, ‘Go On Downtown’, by the prolific Texas songwriter and performer Robert Earl Keen, seems custom built for Welch’s style, though the opposite is probably true in that Welch was influenced by Keen’s style for Revival, unhurried and lonesome, its syllables effortlessly stretched out; and ‘Georgia Road’, a slow-paced 12-bar blues, purposeful and with some fine trilling on the solo. Disc 2 offers many more surprises: ‘I Don’t Want To Go Downtown’ is another mournful blues; ‘455 Rocket’ a toe-tapping rockabilly car song with a great James Burton-style solo from Rawlings; ‘Dry Town’ a fabulous and witty original song in the style of Johnny Cash, chugalong country with Rawlings offering a spot-on Luther Perkins impression; ‘Riverboat Song’ an absolute gem, Just Backdated’s star choice from the new songs, a gorgeous melody with lyrics about a great old river that rolls along into the sea, lonely now that the river men and paddle steamers have gone, but still mighty, wide and liable to flood; and ‘Old Time Religion’, the traditional bible-thumping gospel sing-along that evokes the congregation at some little ol’ wooden shack of a church where its worshippers arrive in horse-drawn carriages. In amongst these is that second, pedal-steel driven ‘Paper Wings’ and the disc concludes with the publishers’ demo of ‘Acony Bell’, Welch’s exquisite song about a wild flower, after ‘Orphan Girl’ my favourite track on Revival, and the song that gave its name to their personalised record label. All of which means that you’ll have to look very hard to find music as charming, eloquent and inspired as that on the second half of this second disc. Now all we need is a brand new record, not to mention a few overdue British dates. For anyone interested, a last minute change of heart caused me to vote for Joe Tex, the direct result of an intervention by a Just Backdated reader who recommended I acquaint myself with his work. So I bought a 3-CD Joe Tex Anthology which I've been enjoying immensely over the last few days and can recommend to anyone who enjoys great soul music. Joe pushed out The Zombies, described by an old friend of mine who lives in New York as 'wrinkled old tarts', which was perhaps a tad on the intemperate side but I know where she's coming from and it's not St Albans, just north of London, where the Zombies assembled way back when. So my final selection was Chic, Joe Tex, Kraftwerk, MC5 and Yes. Thanks to all who helped. More Beatles. I was asked to review this just-published book for the Beatles UK Fan Club magazine. During 33 years as Editor-in-Chief at Omnibus Press a month rarely went by when I didn’t receive a proposal for a book about The Beatles, their authors gamely trying to find some new angle to interest readers. They ranged from the extreme (Why I Hate The Beatles) to the tangential (The Jimmy Nichol Story) to the unpublishable (deathly dull academic music studies). There were a few exceptional books (Graeme Thomson’s biography of George, diary style books by Keith Badman and the Beatles Monthly photo book) but far more were rejected than accepted. Pitched into this crowded market now we have Visualising The Beatles (Orphan Publishing, large format, paperback, £25) by John Spring & Rob Thomas, graphic designers with a distinguished record in this line of work who have used their skills to create an original and highly attractive info-graphic book about our heroes, 250 pages of charts, tables and diagrams that are beautiful to look at but don’t really tell us much we don’t already know. Still, ‘we’ are probably not the market they are seeking. The fresh, computerised, techno-age feel of the book, its easy-on-the-eye pastel colours, its exclusive focus on facts and the all round clarity in which the data is presented seems to be aimed at those with short attention spans who don’t want to get bogged down in details or theory; probably on-the-go millennials, the generation that – almost fifty years after Pepper – might reasonably be asking what all the fuss was about all those years ago. Visualising The Beatles answers their question. After a few introductionary pages about Liverpool and Hamburg, the book is arranged chronologically, album by album, with the various facts and figures illustrated by charts, most pertaining to a particular LP. The categories are pretty much the same for each – covers vs originals (until they wrote the lot), who wrote and sang what, track lengths, song keys, success (chart positions of individual tracks released as singles), volume and intensity (which is a bit difficult to follow as these strange circular diagrams do not specify what track is being measured), instruments played, performances (gigging years only) and style (how JPG&R dressed and wore their hair). Preceded by appropriate news timelines from the real world, this pattern is followed all the way from Please Please Me to Let It Be with a few diversions here and there to accommodate exceptional events like occupying the top five places in Billboard in 1964, their movies, the Apple rooftop concert and Paul’s mysterious death. I was especially taken with the ‘who wrote what’ graphics that demonstrate precisely the ebb and flow of compositional work undertaken by John and Paul, and to a lesser extent George. These little diagrams confirm how the two principal songwriters in The Beatles grew apart, most dramatically on the ‘White’ album wherein the first disc’s 17 songs were all individual efforts, with only three joint compositions (one of them ‘Revolution 9’ to which George and Ringo but not Paul contributed) out of 13 on the second disc. Some, but not all, of the albums have those most common word charts, with the most frequent in big letters, ‘Love’ invariably taking pride of place. Also, the ‘what they looked like’ graphic Beatles are incredibly cute in their collarless jackets, through Pepper uniforms and finally the Abbey Road zebra crossing look. 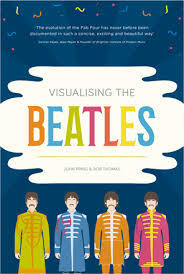 With its focus on statistics, the book certainly brings home the vast scale of the Beatles’ achievements. I long ago grew tired of dim-witted tabloid journalists comparing the success of the latest boy band to The Beatles or even, heaven forbid, suggesting they might be “bigger than The Beatles”. This is complete rubbish, of course, because becoming “bigger than The Beatles” is simply unattainable in the modern era. The Beatles’ achievements, as detailed herein, are easy to digest and will forever remain unique because the music industry is a vastly different animal in 2016 than it was when The Beatles were active. That said, the book is not without its flaws. In covering the albums in the way that they do, a number of important non-album hit singles (‘She Loves You’, ‘I Want To Hold Your Hand’ and ‘Hey Jude’ among them) are ignored. It would have been nice for these songs to have been included somehow and given the ‘who wrote and sang what’ treatment alongside all the album tracks. Towards the very end of the book, across a two-page spread, there’s an alphabetical list of all those artists who have covered Beatles songs, hundreds of them in ten columns in the tiniest type imaginable, white on red, a worthy but (in view of its illegibility) rather futile inclusion I thought. Also, for a book that is chock full of illustrations it’s odd to note that it contains only two actual photographs of the four Beatles together, and just six individual shots, and all eight are no bigger than the removable centrepiece on a 7” single. In the context of this book, this doesn’t matter all that much but I can’t help thinking that it was a way of keeping the photo budget as tight as possible. There’s a lot of blank space within its pages but that’s a style issue and Visualising The Beatles is among the most stylish Beatles books ever. Indeed, it’s a classic from a graphic design standpoint and I can see it winning prizes for this alone. Highly recommended for Beatle beginners and those into state-of-the-art book design; nice to have but not essential for experienced Beatle hands. Once again I am called upon to vote for nominees to be inducted into the Rock & Roll Hall of Fame, that worthy American Institution in Cleveland where the great and the good who produce the music we love are mounted like statues along ‘Route 66’. Some of those nominated have been up before, others are new, but as the years go by I cannot be alone in thinking that time has eroded the eminence of the nominees, of which this year there are 19, an unusually large amount. As ever I can pick five. In alphabetical order they are: Bad Brains, Joan Baez, The Cars, Chic, Depeche Mode, Electric Light Orchestra, Janet Jackson, Jane’s Addiction, The J. Geils Band, Journey, Chaka Khan, Kraftwerk, MC5, Pearl Jam, Tupac Shakur, Steppenwolf, Joe Tex, Yes and The Zombies. It’s a mixed bunch to say the least, ranging from folk to prog, with pretty much everything in between – R&B, soul, AOR, punk, eletro, new wave, grunge, rap, you name it. I don’t think I have ever been faced with such a wide choice. Interestingly, The Smiths – for whom I have voted in the past but who failed to be inducted – are not on the voter form this time around. Was Morrissey spectacularly rude about the HoF? If so I must have missed it. I’d vote for Johnny Marr any day. But let us now consider who I can vote for. 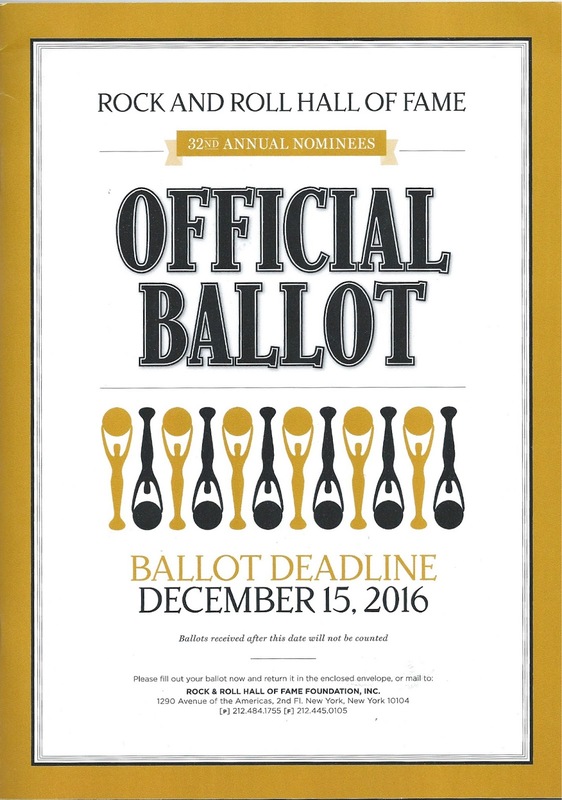 In the past I have nominated both Kraftwerk and Yes and I will do so again. Townshend’s work on Who’s Next aside, Kraftwerk’s pioneering use of synthesisers is the foundation for modern dance music and in addition they wrote some lovely, sensuous melodies, of which ‘Europe Endless’ and ‘Neon Lights’ are supreme examples. Regrettably, as I noted before, only Ralf Hütter of the ‘classic’ Kraftwerk (Ralf, Florian, Karl & Wolfgang, all nominated) is still in the group and he’s alienated the other three by sustaining the lucrative KW franchise all for himself, and this might compromise their situation with regard to the ceremony in the event that they are inducted. There is no love lost between the four of them, not least because Hütter is fabulously wealthy and the others aren’t. Nevertheless, they deserve to be in there, even if the way in which they conducted their career was the antithesis of the clichéd rock'n'roll lifestyle. I have some history with Yes, as can be seen from the two posts about them on this blog, and for them to be inducted would be a fitting tribute to their late bass player Chris Squire, the only Yesman to stay the course through dozens of personnel changes, and also to fellow co-founder, singer Jon Anderson, whose health has given cause for concern in recent years. Incidentally no fewer than eight former or active members of the group have been nominated: Jon and Chris, together with guitarists Steve Howe and Trevor Rabin, keyboard players Tony Kaye and Rick Wakeman, and drummers Bill Bruford and Alan White. So who else? Let’s eliminate a few first. Perhaps shamefully (and this hasn’t happened before), I am insufficiently familiar with the work of Bad Brains, Jane’s Addiction and Joe Tex to consider them. Joan Baez is a folk singer with a wondrous voice and a renowned activist on the left side of the political divide but she isn’t rock’n’roll. ELO were never my cup of tea, ditto Chaka Khan, Janet Jackson and Tupac Shakur. Although I’m familiar with their stuff, I wasn’t much of a fan of The Cars, Journey or Pearl Jam. That leaves six, of which I can pick three: Chic, Depeche Mode, The J. Geils Band, MC5, Steppenwolf and The Zombies. 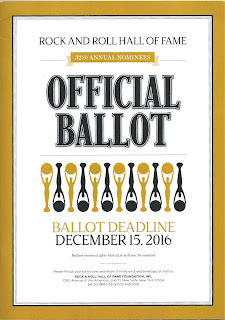 Well, it’s a crime that Nile Rodgers isn’t already a member of the HoF and Chic have been nominated before, so there’s one of my votes. Depeche Mode will have another chance. The J. Geils Band deserve to be in but it’s not a crime they’re not, not yet anyway. MC5 were America’s first punks, anti-establishment to the max, and I want to vote for them, especially now if you get my drift. As is well known, Steppenwolf coined the term ‘heavy metal’ but, ‘Born To be Wild’ aside, what else? The Zombies were great (and I had a passing acquaintance with the late Paul Atkinson when he worked as an A&R man for Columbia Records in New York in the 70s) and I want to vote them in. So it looks like Chic, MC5 and The Zombies alongside Kraftwerk and Yes. Any Just Backdated readers care to differ and sway my intentions? I need to get my vote in by December 15, so don’t hang around. 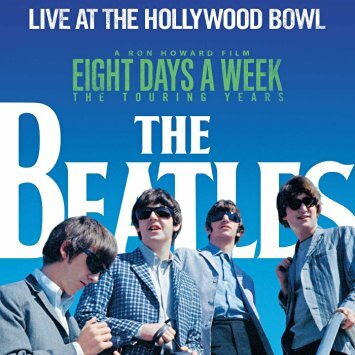 To accompany the film Eight Days A Week: The Touring Years, Apple Records, now part of Universal Music, has re-released as a CD the LP The Beatles Live At The Hollywood Bowl, until now available only on vinyl. Originally released in 1977, it didn’t stay around long, though it was reissued on EMI’s downmarket MFP label around 1980, then allowed to slip out of print, probably because after the death of John, who approved it, the others weren’t so keen. I liked it a lot, however, if for no other reason than that it was a cherished memento of the social revolution we call Beatlemania, and I still have my vinyl copy. Oddly, this edition is still available on Amazon, reasonably priced (used, at around the £15 mark) and outrageously priced (£500 mint). My copy has got a hole punched in the top right hand corner of the sleeve, which indicates it’s a promo copy; this tallies with it being not on Parlophone but on the Capitol label, ie the US version, as in 1977 I was living in New York. 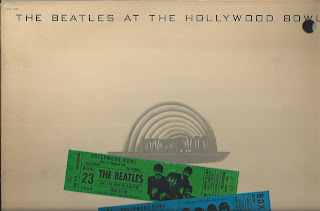 My original Hollywood Bowl album with the hole punched out. It isn’t quite mint but it’s not far off, probably because I would have played my bootleg Beatles Live At Shea Stadium far more, without realising until much later that it was a recording from the same shows misleadingly titled. I can still remember the thrill of acquiring this (in 1971) from a record shop in Chancery Lane, around the corner from the Melody Maker offices in Fleet Street, that specialised in under-the-counter stuff. I liked to play it at parties, really loud, and watch the reaction when the announcer shouts, “And now… here they are… The Beatles” as they crash into ‘Twist And Shout’. Invariably everyone looked at one another with an expression of total joy and started dancing. So it follows that having played this bootleg album to death, I didn’t play the authorised version that much when it arrived six years later. The new CD offers the same track listing (‘Twist And Shout’, ‘She’s A Woman’, ‘Dizzy Miss Lizzy’, ‘Ticket To Ride’, ‘Can’t Buy Me Love’, ‘Things We Said Today’, ‘Roll Over Beethoven’, ‘Boys’, ‘A Hard Day’s Night’, ‘Help!’, ‘All My Loving’, ‘She Loves You’ and ‘Long Tall Sally’) with four bonus tracks (‘You Can’t Do That’, ‘I Want To Hold Your Hand’, ‘Everybody’s Trying To Be My Baby’ and ‘Baby’s In Black’) which were no doubt left off the original vinyl for space reasons. The accepted wisdom is that as The Beatles became more accomplished in the studio their live performances deteriorated, this largely because no one could hear them play anyway, least of all themselves, so there was no point in trying. The group themselves, most notably John and George, promoted this notion, as did the crap-sounding unofficial live recording from Hamburg that was released just before the original vinyl Hollywood Bowl album. It didn’t help that this was an amateur recording taped at a time when The Beatles were bored with Hamburg and probably drunk. After all, it was New Year’s Eve, 1962. We had to wait until the BBC recordings and Anthology CDs for more evidence of how The Beatles sounded live, and with each new instalment opinions were revised upwards. Of course they were never going to sound like The Who or Led Zeppelin but that was because technology had advanced by the time the rock concert circuit came of age. If comparisons are to be made it ought to be with early live recordings by The Rolling Stones and Beach Boys – the only two contemporaries whose live albums I own since most ‘pop’ acts didn’t bother with live records in those days – and in this company The Beatles are magnificent. The Stones’ only live effort from the era, Got Live If You Want It!, is a dog’s dinner of dodgy overdubs and fakery on a seismic scale, and The Beach Boys, for all their vocal prowess, sound thin and weedy. 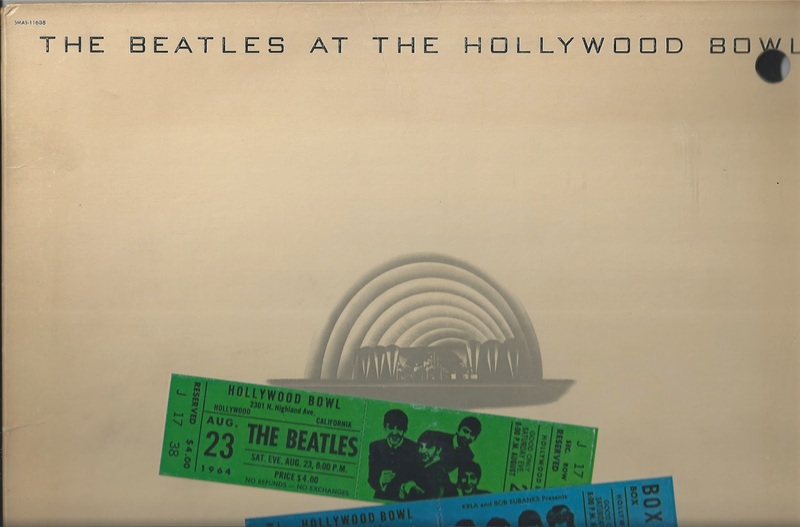 So it gives me great pleasure to report that on Live At The Hollywood Bowl, its tracks taken from three concerts there (August 23, 1964, and August 29 & 30, 1965), The Beatles trounce them both. Somehow, despite the conditions, they manage to conjure up some of the magic that drew crowds to the Star Club in Hamburg and The Cavern and everywhere else around Liverpool when they really were the best rock and roll band in the world. Nowhere is this more apparent than on ‘Things We Said Today’, which – as booklet contributor David Fricke points out – is a startling reflection of just how good they could be when they really tried. The magic moment comes in the leap from verse to middle-eight, the surge from A minor to A major, when they abruptly move into supercharge mode, piling on the volume and effort as Paul sings the line ‘Me I’m just a lucky guy’ and the audience, recognising the moment, respond in kind. Much that is called awesome these days is not. This really is. Nevertheless, there is evidence to suggest that The Beatles didn’t want to tax themselves: six of the 13 tracks on the original LP were fairly straightforward 12-bars (as are two of the four bonus tracks), and ‘Twist And Shout’ is a three-chord song that beginners learn in the guitar equivalent of primary school. George is therefore called upon to chomp down a lot on that barred major up and down his fretboard while his little finger does the work, as John is no doubt also doing though it’s difficult to make out his rhythm guitar above the sharper noise from George’s Gretsch, Paul’s bass – which comes through remarkably well, far louder than on the studio albums – and Ringo’s sturdy, no-nonsense drumming. Vocally, both John and Paul are in great form throughout, though John sounds a bit off key here and there and loses the plot a bit towards the end of ‘Help!’, much to his own amusement. He has a slight tendency to bellow but when that seriously snappy voice of his comes cutting through like a knife, it’s one of the greatest rock’n’roll voices you’ll ever hear. ‘Twist And Shout’, the opener, is truncated – just over a minute, the final bit, after the guitar solo on the recorded version – but gets things off to a flying start, and ‘She’s A Woman’ swings like it always did, Paul’s rolling, loping bass line to the fore, and when he screams at the end it’s like a pressure cooker being let off. George’s solos often ramp things up, no more so than in ‘Dizzy Miss Lizzy’ (which is spliced together from two separate performances of the song) and when John and Paul choose to sing together, as in ‘Ticket To Ride’ and, later, in ‘A Day’s Night’ and ‘Help!’, it sounds terrific, that wonderful Beatles harmonic that seduced the world. George takes the heavy load, vocals and lead guitar, on ‘Roll Over Beethoven’ though his second solo is a bit ragged, and Ringo’s party piece ‘Boys’ is taken at such a furious pace that it can’t have been easy singing and drumming at the same time, especially with all that din around him. From the evidence of the photos in the booklet, his drums weren’t miked at all in 1965 (though the amps were) and there was only a single mike suspended above his head in 1964 (when the amps weren’t miked at all). Nevertheless you can hear Ringo clearly throughout, steady as a rock in a tidal wave. Paul is especially impressive on ‘All My Loving’, again taken a bit quick, his busy bass thumping away, and John helps out on the final verse. ‘She Loves You’ is a predictable scream fest, especially when Paul and George yell ‘Ooo’ at the top of their voices and no doubt shake their heads to fuel the fan fervour. ‘Long Tall Sally’, also fast, closes the set, Paul’s vocals as raucous as ever though George runs out of steam on the second solo, not that it matters. There is no perceptible difference between the 1964 and 1965 recordings, but the four bonus tracks don’t quite hit the spot in the way that the other 13 do. They’re OK but not great, ‘I Want To Hold Your Hand’ the best of the bunch, with massive screaming after the ‘I can’t hide’ line, and though ‘Baby’s In Black’ is a bit plodding John is to be commended for his perfect pitch on the higher notes. This edition has been remixed from the original three-track tapes by Giles Martin, son of George, and is certainly a better listen than the vinyl that I played again this week for the first time in many years. There’s also a decent booklet with helpful sleeve notes, including Georg Martin’s original from 1977, contemporary news reports and plenty of pictures.